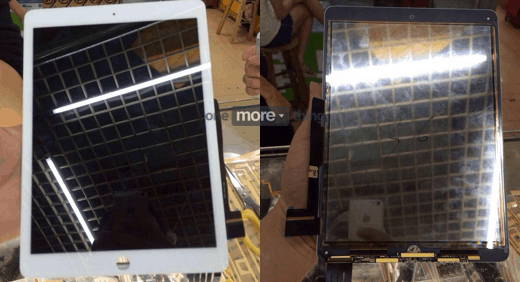 Newly discovered photos on a Dutch gadget blog reveal what could be components for the next iPad. OneMoreThing.nl stunned this blogger this morning with a couple photos of what could be the front panel for the next iPad. The photos (embedded below) show the front and back of the component, revealing that the touchscreen, display, and the front panel are all integrated into a single component. The provenance of the photo has not been revealed, but if you look around the edges of the photos you can see that they were taken inside a repair shop of some kind. Given that iPad and iPhone components have leaked via the repair shop supply chain before, this lends some credence to the idea that we're looking at a real component. It's also worth noting that the iPad Air doesn't have the front panel, touchscreen and display integrated into single component, so this is probably not a part for the current model but more likely a new component designed to make the new model even thinner than the current model. If Apple sticks with the usual annual schedule, the new iPad Air is probably going to ship later this year.